Waiting for the Mayor – Come join us! 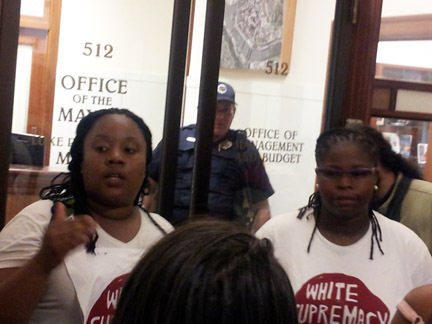 Early this afternoon we made our way to Mayor Ravenstahl’s office to present him with a letter of our demands. At first he sent his assistant out to tell us he would pass the letter on to Ravenstahl. We said that was really nice of him but we wanted him to receive it personally so we started asking for him. 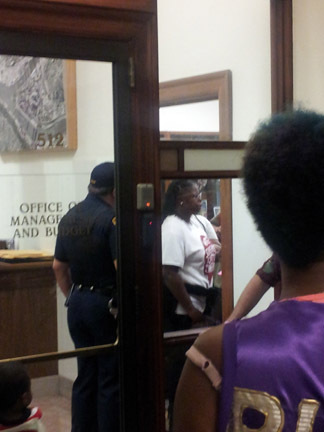 After some more persuasive asking we were told that Mayor Ravenstahl would meet with two of our representatives, but when they went past the police officers stationed at his office door, it turned out the mayor wasn’t there any more. But the people are not so easily discouraged! Some will be spending the night and greet Mayor Ravenstahl bright and early when he arrives Thursday morning. If you want to support please come join us or share our demands with your network! We are on the 5th floor of the City County Building (map). Grant St entrance is open all night. Check out the Facebook event page for photos and updates as well. Link to our demands here. They are also reproduced below if you are not familiar with them. We stand prepared to hold these agencies accountable through mobilizing direct community action until they have begun this work.